Preheat the oven to 180°C/350°F/gas mark 4. Line a baking tray with parchment paper. Place the goat’s cheese slices on the lined baking tray. Place in the oven for 3 or 4 minutes, until slightly softened and warmed through. into a bowl. Add the honey, olive oil and lime juice and whisk well to combine. Stir in the chopped coriander. plates. 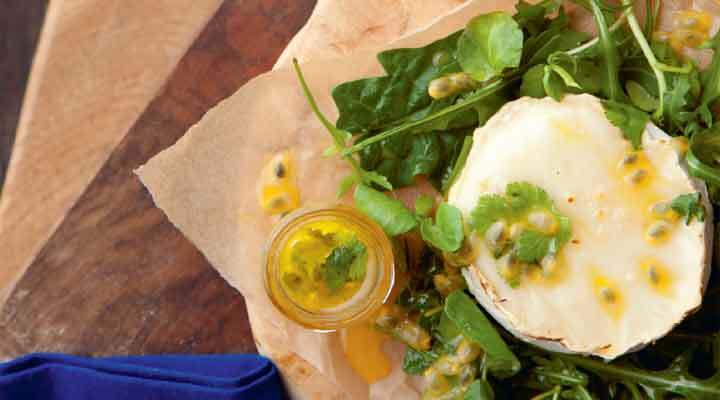 Place a slice of goat’s cheese on top and drizzle the dressing over the cheese and salad. Garnish with the reserved coriander sprigs.